On-line registration has closed, limited space is still available for registration at the door of the event. Sponsors may still make payments and pledges on-line. Sponsorship Opportunities - Invoice Me, enter amount of your pledge to receive an invoice. How would you like your sponsorship credited? I would like to sponsor anonymously. On behalf of the Nebraska Geological Society. 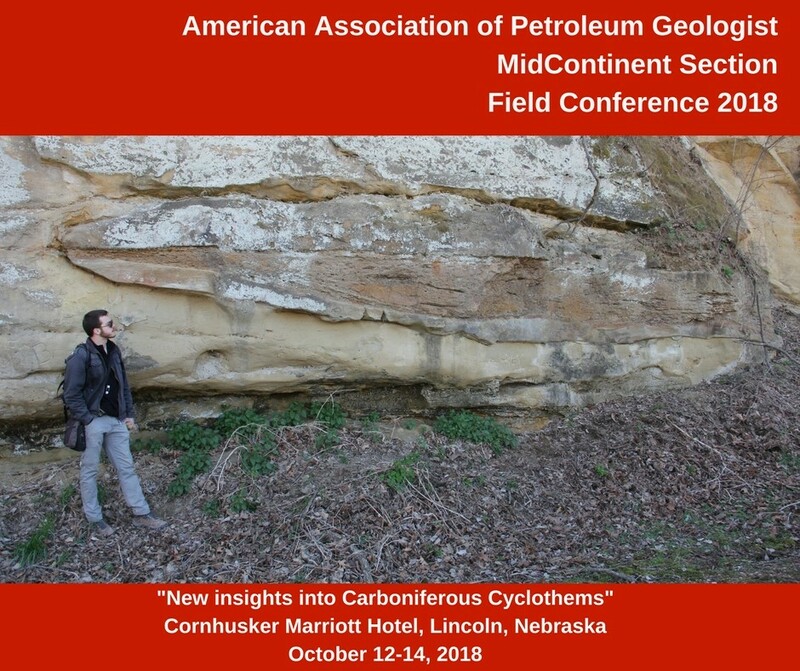 "New Insights into Carboniferous Cyclothems"
$195 - Professional Registration including all meals, events and field trip with comprehensive field guide (by September 20th / $295 after September 20th). $95 - Spouse/Guest Registration (must be attending with a Professional, Vendor/Exhibitor or Sponsor Registrant) including all meals, and events except field trip. Spouse/Guest may add field trip for an additional $100 (by September 20th / $145 after September 20th). $200 Exhibit Space 8' table with electricity if requested (by September 20th / $300 after September 20th). Limit, three tables per vendor / exhibitor (arranged in single line). Only 10 exhibitor spaces available, please register early to ensure your space! 19:00 - 20:30 Screening of AAPG film "Prowess"
Lodging Rate $119 per night is being offered until September 20th. Make reservations by calling Marriot at 1-866-706-7706 and ask for the Mid-Continent AAPG 2018 Field Conference event rate, or book on-line at link above. Event rate available for up to 3 days before or after the conference. The room block is limited so book early! Parking, City of Lincoln owned garages adjacent to the Cornhusker Marriott Hotel, $1 per hour, up to $9 per day. Valet parking is available for $17 per day from the hotel (price subject to change). Additional parking information is available at Park & Go. Cancellations accepted by September 20th less a $75 cancellation fee. No refunds after September 20th.